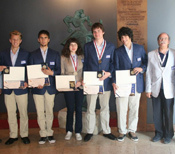 Greek students won two bronze medals, and three honorary distinctions at the 5th International Olympiad on Astronomy and Astrophysics held in Poland (August 25-September 3). The contest was held among 140 high-school students from 26 countries from all over the world. This year’s Olympiad was said to be one of the most competitive, since the academic level was higher and more contenders for less awards. For Greece in particular, the success had a female scent, as Despina Pazouli from the town of Drama (North Greece) became the first Greek girl to receive a medal in the competition. Two of the five winners were at their senior high-school year and the Olympiad coincided with the announcement of their university entry examination. Both of them made it to the Department of Physics of the Aristotle University of Thessaloniki. (GREEK NEWS AGENDA) The 2nd Mediterranean Freediving Meeting and International Depth Competition are being held on the island of Crete between the 22nd June and the 5th of July 2009. The meeting is organised as an event for freedivers from around the world to meet, train, and enjoy the wonderful hospitality of Crete. The 1st Mediterranean Freediving Meeting is based in the picturesque seaside village of Sougia in the south of Chania and includes two weeks of organised depth training followed by a Mediterranean Depth Competition with World Record Status (June 29 and Sunday July 5). Multisport is a family of athletic competitions in which athletes race in a continuous series of stages or “legs,” and rapidly switch from one discipline to another in order to achieve the best overall time. Most multisport events are endurance races, consisting of aerobic activities such as cycling, running, kayaking and cross-country skiing. Greece happens to be the ultimate ideal environment for the practice of such a sport. Schiniathlon (www.schiniathlon.gr), Greece’s main multisport events, are settled in a cycle of three events per year: Spring – Autumn – Winter. The next Winter Schiniathlon will take place on January 25th, 2009 with more fun and challenges for all of you! The event takes place at Schinias bay, Marathonas area, near Athens.